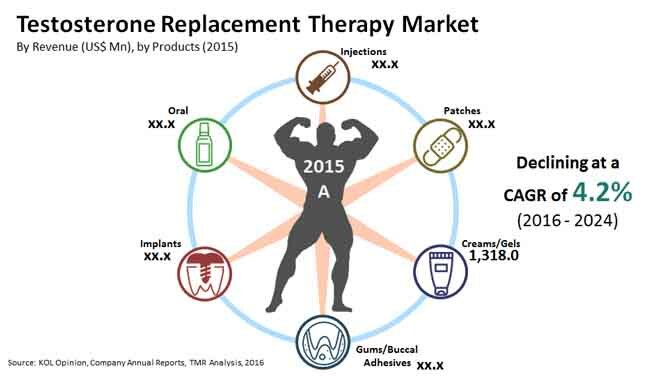 The global market for testosterone replacement therapy is characterized by the presence of a large number of small and large scale manufacturers. All of the manufacturers have been steadfast in filling the meagre market gap in order to enhance their prospects of growth. Furthermore, research and development has been the central characteristic of al the market players operating in the global market. In 2015, it was found that 80% of the total market share was held by the top five market vendors with AbbVie Inc. taking the lead. The large scale vendors are focusing on establishing an iconic brand for their product by resorting to rigorous marketing and advertising tactics. The smaller companies are expected to concentrate on capturing the local and regional markets to sustain themselves in the current scenario of stiff competition. A negative implication for the leading market players in recent times has been the loss of patents for their products. This has not only plundered them of revenues but has also affected the workflow of these companies. The market players are expected to launch awareness campaigns about testosterone replacement therapies in order to educate and inform the consumers. Hence, the market for testosterone replacement therapies is expected to witness the emergence of several new trends and opportunities over the forthcoming years. Some of the key players in the global testosterone replacement therapy market include Bayer AG, Endo Pharmaceuticals, Inc., Novartis AG, and Allergen plc. The CAGR for the global testosterone replacement therapy market is estimated to be -4.20% over the period between 2016 and 2024. The negative growth rate of the global market is expected to take the market value from US2.0 bn in 2015 to a decreased value of US$1.3 bn by 2024-end. Research studies suggest that around 30% of all men suffer from testosterone deficiency, which has driven demand within the global market for testosterone replacement therapy. Furthermore, the population demographic of men in the age range of 40-79 years is more likely to suffer from testosterone deficiency. The need for mutation or having an offspring amongst men in the aforementioned age range has driven demand within the global market. Moreover, the geriatric population has been on a rise, which underhandedly contributes to market growth. Several campaigns aimed at educating people about the benefits of testosterone replacement therapy have been an important propeller of demand within the global market. It is anticipated that more people suffering from testosterone deficiency would resort to these therapies over the coming years. Despite the rising awareness amongst the masses about the advantages of testosterone replacement therapies, the market growth is hindered by the apprehension of the people. The chances of developing metabolic disorders are higher in men who undergo testosterone replacement therapies. Furthermore, the risk of developing cardiovascular diseases also discourages people from resorting to testosterone replacement therapies. The FDA has also cautioned people about the use of such therapies by issuing strict warnings, which has further obstructed the growth of the global market.